Branford, CT. Although they’re all about the thrill of the grill, these homeowners craved a true culinary experience transcending the typical backyard barbecue. To fashion a space both aesthetically fabulous and entertainment friendly, their list of must-haves comprised a buffet and beverage zone with swim-up bar, a warmth-granting fireplace for cool-night cozying, and an outdoor pizza-making station—all nestled near the pool and hot tub. 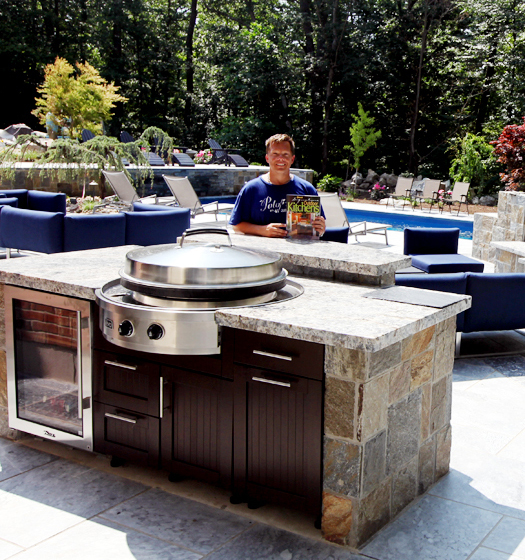 The biggest challenge facing Michael Gotowala of Preferred Properties Landscaping & Masonry? 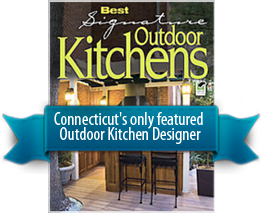 Establishing the project scale - especially as it related to the outdoor kitchen. The sprawling new build needed to blend fluently with the pool while permitting a clean visual connection of the entire array from one corner of the house to the other. Gotowala met his clients’ mandate in spades, reconfiguring the existing deck and lower-level exterior great room stairwell to the outside. Proactive as well as pretty, his two-phase approach also allows for covering a portion of the outdoor fireplace vignette in the middle of the roof structure at a later date. In the meantime, though, we have no doubt the family will be hosting some seriously fun shindigs in their expertly curated outdoor kitchen that also doubles as a patio pizza parlor!